Because Nolly Poly is my best friend. 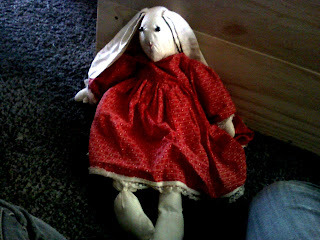 My mom made her for me when I was little. After the character in my favorite book was Nolly Poly Rabbit Tail and Me. I wanted to get it every time we went to the library. Even though I turned it in 2 seconds earlier. I didn't get that, that's not what you were supposed to do. Awhile after my mom past away, my dad bought me the book. How glad I am that he did; I don't think they print it anymore. And it's like impossible to find one, I would know I have tried. After my Mom past away I also got chosen for this book contest thing at the library. You had to explain what your favorite book was and why. You had the opportunity to go on TV and talk about it. I am grateful my Mom made Nolly for me.